To succeed, content marketing must make the buyers’ path clear. Buyers seek to answer specific questions during each step in the buying journey. And they prefer different types of content at each step. Imagine that the buying process is like crossing a river on stepping stones. Your buyers need to follow a clear path, all the way across the river, to make a purchase. If the content that buyers need is missing, that’s a gap — a missing stepping stone — which forces them to turn back. Closing those gaps leads to more customers and cash. Here’s a Slideshare presentation on this topic, and an infographic. Smart content marketers offer buyers the right content type throughout the buying journey. Research about business-to-business technology buyers by Eccolo Media sheds light on which types of content to offer buyers at each step. 1. Blogs can launch the buyers’ journey. During pre-sales, buying decision-makers prefer blogs (used by 37%) over infographics (27%), videos (26%) and white papers (26%). Regularly published blogs can generate thousands of followers, translating into one-quarter or more of website traffic. Compared with decision-makers, buying influencers prefer a different mix of content. During pre-sales, they prefer blogs (33%), but they place a greater emphasis on white papers (31%), and less on infographics (22%) and case studies (20%). 2. During initial sales, buyers seek blogs, videos, white papers and more. In this step, decision-makers consult blogs (30%), videos (30%), white papers (30%) and case studies (29%) almost equally. Buying influencers seek more detailed information earlier in the buying process. They want a variety of content, led by videos (47%), case studies (42%), blogs (36%) and infographics (36%). When customers click on a white paper, they expect to find thought leadership to address a specific problem, including an objective comparison of alternative approaches. They reject thinly veiled product information that pretends to be a white paper. 3. During mid-sales, buyers read case studies and detailed technology guides. Customers seek third-party support via site visits, testimonials and peers. You can best bolster your credibility through third parties – including reference customers, trade media and industry analysts. In this step, decision-makers gravitate to case studies (32%), followed by detailed technology guides (30%), white papers (28%) and videos (27%). Influencers seek detailed technology guides first (36%), followed by infographics (31%), white papers (27%) and case studies (27%). 4. As a sale closes, buyers seek infographics and detailed technology guides. For decision-makers, content marketing needs to reinforce their buying decisions with infographics (22%) and detailed technology guides (22%). Here’s an infographic on how to map content to the buyers’ journey. Buying influencers back away from content during this stage. A few seek detailed technology guides (18%) or blogs, infographics and case studies (tied at 11%). 5. After the sale, buyers continue to consume content. Even when the sale is closed, buyers expect content marketing to continue. Almost 3 out of 4 buyers in large firms (72%) say it’s important or very important to receive ongoing content after their purchase — specifically white papers, case studies and technology guides. Content marketing after the sale builds stronger customer relationships that can lead to future sales. That’s why a content marketer’s job is never done! 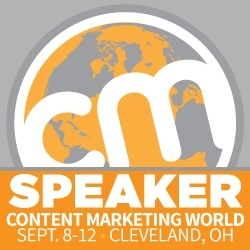 Here’s a Slideshare presentation on this topic from Content Marketing World. Content Marketing Strategy: What Are 3 Key Steps?